Who knew you could make a simple jam without cooking?! I brought in some of the fresh blueberries to share at work not too long ago. My friend Jill liked the blueberries so much that she suggested I make some into a jam. A freezer jam. What? What's that all about? So I researched freezer jams a bit and soon found myself with this sweet and slightly tart deliciousness. You could apply the same process with other fruit such as strawberries, raspberries and even blackberries! I enjoy this over some toast, pancakes, waffles, and my niece especially liked it over homemade doughnuts. 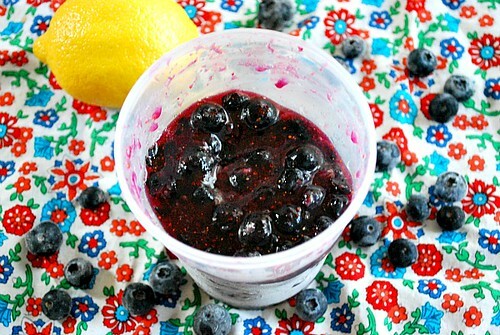 Combine the crushed blueberries with lemon juice and lemon zest in a large bowl. Add sugar, mixing thoroughly. Let stand 10 minutes. Combine water and pectin in a small saucepan. Bring to a full rolling boil, stirring constantly. Boil hard for 1 minute, continuing to stir. Add the cooked pectin mixture to fruit mixture and stir for 3 minutes. Ladle jam into clean Ball® freezer jars leaving 1/2 inch headspace. Apply caps and let jam stand in refrigerator until set, but no longer than 24 hours. Serve immediately, refrigerate up to 3 weeks or freeze up to 1 year. 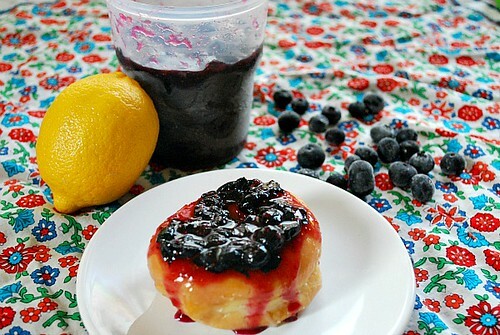 I've been on the search for blueberry canning recipes since I hope to pick a bunch within the next week. I got back into canning this year after taking a few summers off. So far I've canned garlic dill pickles, sweet pickle chips and quartered tomatoes (and I expect to can a lot more tomatoes!). I especially love having the tomatoes to go to all year round.